When lights come up on Having Our Say at DeSoto Corner Theatre, resident venue for African American Repertory Theater, a curious audience finds two kindly looking elderly African American women inviting it into their comfortably appointed home to share a cup of tea. That audience just doesn’t know what it’s in for. The duo are Mount Vernon, NY’s famous Delaney sisters, Sadie and Bessie, spry, vivacious centenarians, ready to share one hundred years’ worth of life experience and wisdom in no nonsense, intimate detail, along with tea and a meal they prepare and serve during the course of the two-hour play. Based on a series of 1991 interviews with the two actual sisters, Amy Hearth wrote a New York Times article that became a 1993 best-selling book, Having Our Say: The Delany Sisters First 100 Years, In 1995, Emily Mann, multi-award winning Artistic Director and Resident Playwright of McCarter Theatre in Princeton, New Jersey, adapted the book into play form. On Broadway it received three Tony nominations, including Best Play and Best Direction, and a Drama Desk nomination. It won a Joseph Jefferson Award and an NAACP award, and it went on to receive Peabody and Christopher Awards for Mann’s screenplay adaptation for the 1999 television movie version starring Diahann Carroll and Ruby Dee. Hall as Bessie speaks most of the play’s laugh lines; “I’m a naughty little darky,” delivered with deadpan devilish merriment, elicits quite a guffaw from the audience. Both describe hardships and adversity they and their family endured, from the 1920’s through the Civil Rights era, as they grew up and chose unusual professions, with a clarity and respectful awareness that attest to their inner strengths as well as reveal the history of a changing century in an unforgettable manner. Full of love and gracious good manners, Hall and Pinkard present a heart-warming picture of two remarkable women who lived with principles, knew who they were, loved each other and believed in a mission to “help somebody.” A remarkable feat of story-telling spanning over one hundred years in history, it’s not “new and trendy”; but Emily Mann’s play as brought to life by these two terrific actresses makes worthwhile, enjoyable theatre. At the end it’s hard to keep from wanting to rush up on stage into the dining room set to join hands with the two women as they pray over the meal they’re about to enjoy. You know they’d make room at their table, no matter your race, status or political orientation. William “Bill” Earl Ray directs Having Our Say with low key, stylized naturalism. The exquisite, homespun set design is by Bryan Wofford with set construction by Arthur (Karioki) Riggin and Jessie (Yishael) White. Lighting by Nikki DeShea Smith, sound by Craig Willis and properties by Julia E. Cotton compliment the “at home” effect. Video projection on the “dining room mirror” in the Delany home by Trey Simeon helps place historical events alongside the play’s narrative. 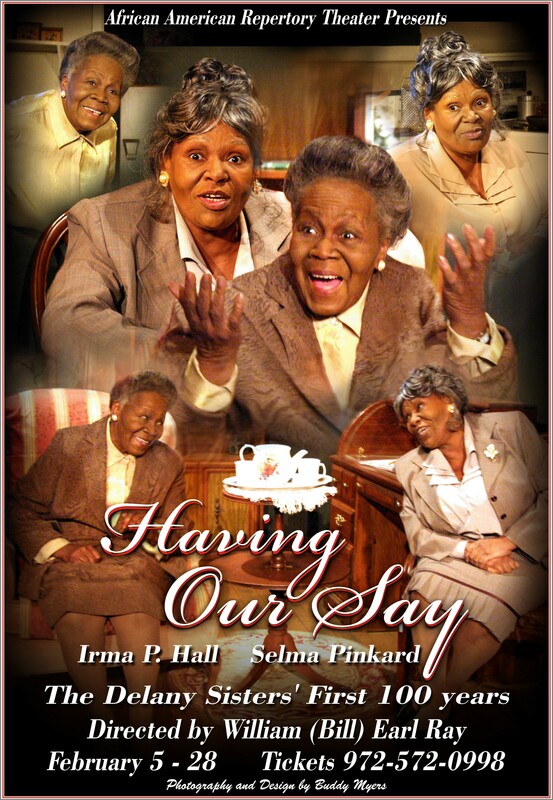 Having Our Say runs through Sunday, February 28, at the DeSoto Corner Theatre, 211 E. Pleasant Run, DeSoto, Texas. For ticket information, please visit the AART website at http://www.aareptheater.com or call (972) 572-0998.